Now and again, I come face to face with the fact that I don’t have all the facts. The most recent example of this occurred yesterday, when I learned that the glacier to which we tried to hike the day after arriving in Anchorage was NOT Portage Glacier. 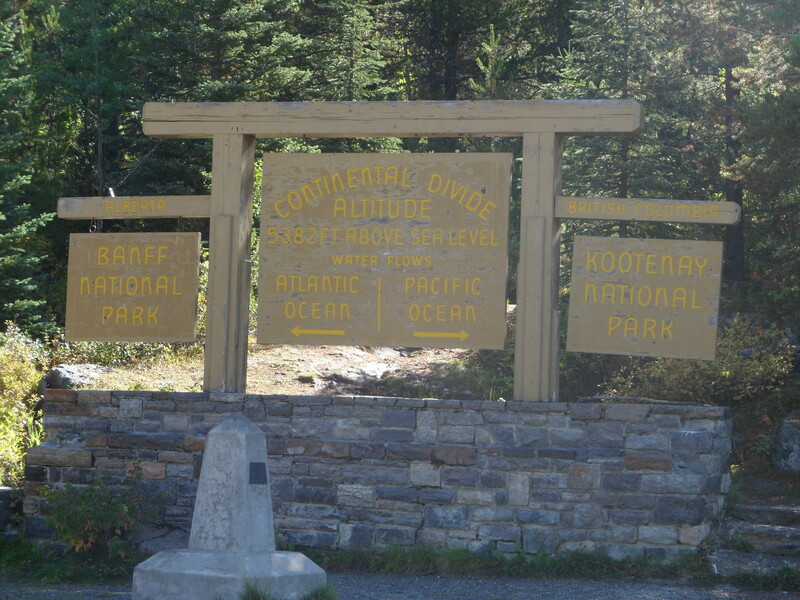 Apparently one can attempt to ascend Portage Glacier, but not from where we were. It was a reasonable mistake given other facts at my disposal. For example, just prior to our hike we had spent some considerable time at Begich-Boggs Visitor Center, where various sources discussed and described the retreat of Portage Glacier and all the changes resulting therefrom. Adding to my confusion was the fact that Begich-Boggs Visitor Center overlooks Portage Lake, which was created from the meltwater running off Portage Glacier. So, it wasn’t a big leap for me to assume that the glacier we were hiking up to was in fact Portage Glacier. Okay, I suppose I could have asked someone where we were going. And I guess I could have read the lovely sign the park service had placed at the entrance to the trail. But we were so busy chatting—about the weather, the size of the icebergs dotting the lake, et cetera—that I didn’t have the opportunity to inquire as to where we were going, much less to stop and read the sign as we passed it. And when we weren’t chatting, I was focused on other matters, such as: How would I fare on my first real hike with my new knees? Would my new boots provide the grip I would need to avoid slipping and falling down the rocky hillside? If the boots or my knees should fail me, would the Jarhead have the wherewithal to help me back to the car? Or would he need assistance from LaVon and/or her husband, Tom? If I were I unable to put weight on either leg, would the three of them be willing to carry me back to the car, or would they drag me to an isolated area just off the trail and leave me die of exposure? I’m kidding of course. It was warmer in Anchorage then than it was in Wisconsin that day, so I was less likely to freeze to death than be mauled and eaten by a bear. Plus, these folks have all known me long enough to know how loud I can scream and for how long. Which means they know that leaving me behind would require at least a gag and a blow to the head—if not a knife, a gun, or a crossbow—which would greatly reduce if not entirely remove any chance they had of convincing the authorities that my death was just an unfortunate accident. And so, light of heart—if not fleet of foot—I picked my way up the trail behind my three companions. Every now and then the Jarhead would turn to check that I was still upbeat and upright, or to allow me to catch up to him. And every now and then he would offer me a hand so I could scramble over rocks, or up and over a particularly steep section of ground. Along the way we passed several other hikers of varying ages, sizes, and ethnicities. The sight of these people made me so happy—not only because their presence improved my chances of survival, but also because they all seemed so cheerful. Well, all except for one family, who evidently had been forced to go up a second time to retrieve a pair of children’s shoes only to find them not where the child thought she’d left them. For her sake, I hoped someone had found them and brought them back down the trail and set them down for the owners to find, or the ride to their next stop was going to be a lo-n-g one. Apart from them, everyone we passed was the picture of happiness. Oh, I suppose what looked like happiness may have been relief—either at having finished the climb or because they would soon be able to sit, eat, or use the restroom. But seeing them all coming back from the trek with what looked to be smiles on their faces bolstered my confidence that I, too, would return fit and happy from the journey. And so I smiled at everyone we passed, and nearly wore out my vocal chords verbally greeting those who returned my smile. Eventually we made it as far as we dared up the path toward what I now know was Byron Glacier. Like Portage Glacier, Byron Glacier is retreating, and in order to get to it, one must ascend a sizeable pile of boulders that sit amid the rivulets of meltwater that combine to form Byron Creek. Without hiking poles, an all-terrain vehicle, and/or a skilled Sherpa, I knew I wasn’t up to the challenge. But the Jarhead was game to touch the ice, so LaVon, Tom, and I decided to watch him go and wait for him to come back. Not to sound like a Pollyanna, but it was a gorgeous wait. The warm sun and the cool breeze made for the perfect weather to be outside, and all around us were the sight and sounds of nature—water tumbling over rocks, sun glistening off the ice, grasses and trees rustling in the wind. And along with the sights and sounds of nature were the sights and sounds of people enjoying it. No one was whining, crying, or fighting. Everyone was smiling, holding hands with or hugging someone, gazing up at the sky or the mountains, or looking down at the water and rocks. It made me wonder if people behave more lovingly when they experience nature, or if people who pursue nature are more loving. Either way, it was an amazingly lovely day. And it was made even better when the Jarhead returned from his quest unscathed. Although he did not succeed in touching the glacier—he decided to turn back rather than brave the terrain without the proper gear—he was glad for having tried, and for not having fallen into the creek in the process. I must admit to being somewhat surprised that he came back when he did. Not because I expected or wanted him to get wet or cold, but because our plans for the evening included going to a high school football game, and about the only thing the Jarhead dislikes as much as getting wet or cold is football. But he chose to be a good *ahem* sport, and join us back on the main trail rather than hide out among the boulders until he was sure we’d missed most of the game. And so, after a quick dinner of bacon-wrapped jalapeno poppers, we headed for the field to watch LaVon’s son’s football game—or, more accurately, to watch several other people watch LaVon’s son’s football game. Road Trippin’ V: Rocky Mountains–Hi! Banff National Park was everything people said it would be and more. And yet, somehow, Kootenay National Park was better. Maybe it just seems that way because no one talked Kootenay up before we left and so our expectations for it were not that high. 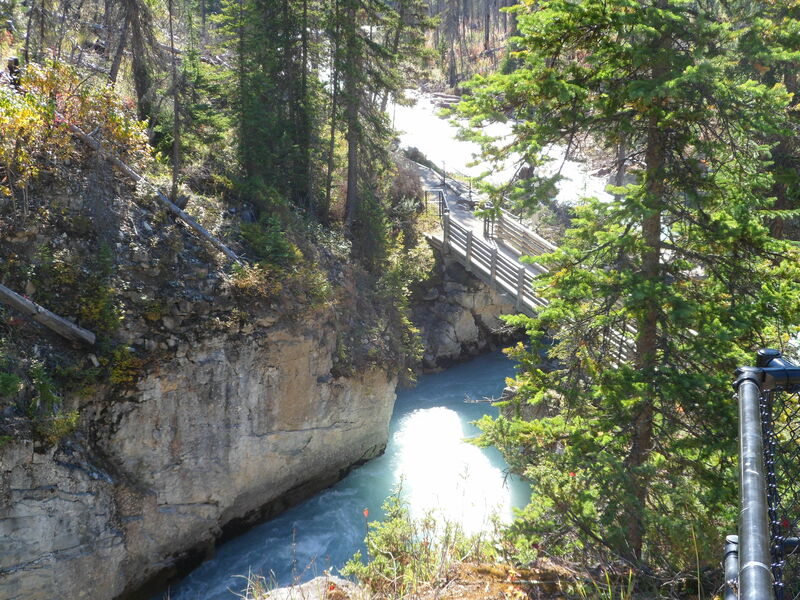 Or maybe Kootenay really is better, but nobody knows that because fewer people go there. Or maybe folks are bragging up Banff over Kootenay the way early explorers did Greenland—so everyone will go there instead of Iceland. 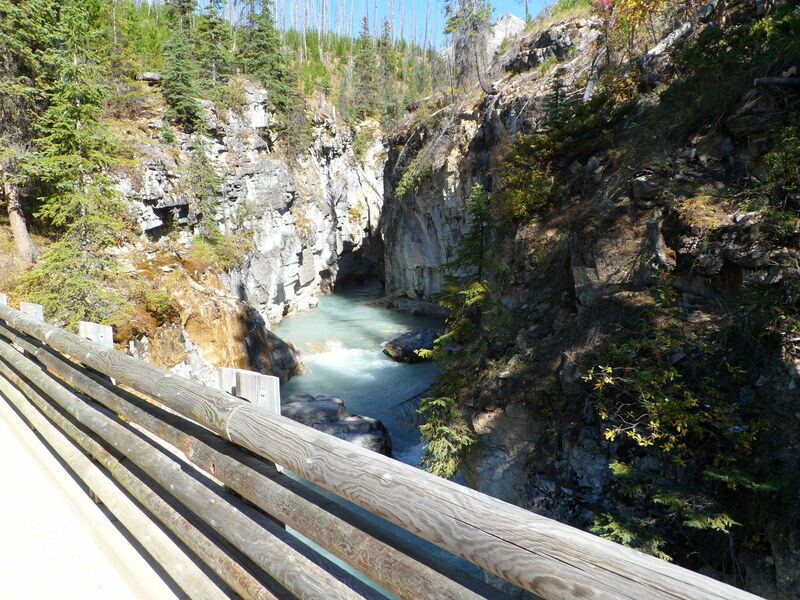 Among the many wonders in Kootenay, our favorite was Marble Canyon. 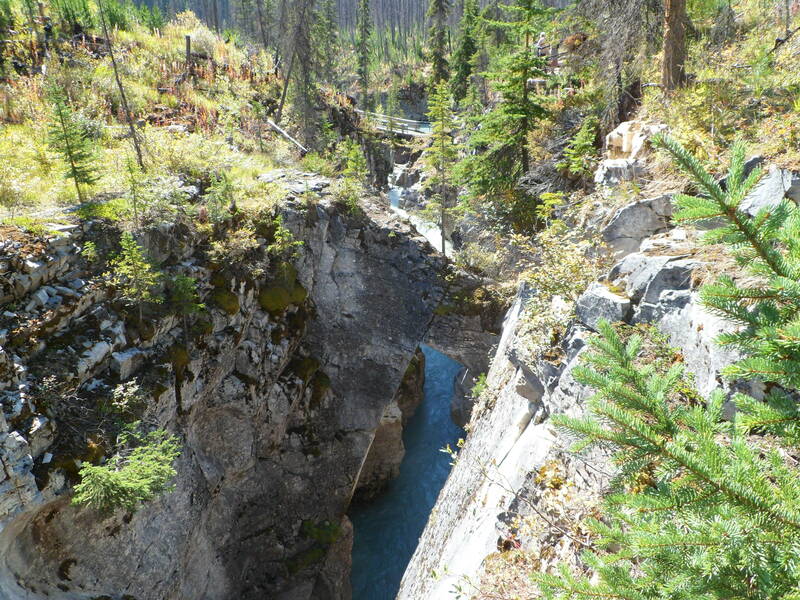 Situated between Lillooet and Cache Creek, the canyon is what the experts call a collapsed Karst formation, which basically means it’s a cave whose top has washed or worn away. The word ‘marble’ in the title apparently refers to the color and texture of the rock forming the canyon walls rather than the type of rock itself, which is not marble but limestone—and which explains why it’s washing/wearing away. Before we headed up the trail that runs along the canyon, I was just another curious tourist wondering what there was to be seen further up the hill. Well that’s not strictly true. I was also—and still am—a victim of osteoarthritis, which is why about halfway up the trail I was wondering if I really cared what there was to be seen further up the hill. It was at about this point that we encountered another 40-ish couple making their way back down. “Don’t give up now,” taunted one of the sadists as I paused to rest my knees. “You don’t want to miss the falls.” Hoping she meant the naturally occurring geographical feature in which large volumes of water flow rapidly over rock formations as they make their way downhill and not the naturally occurring gravitational event in which middle-aged arthritis victims roll rapidly over rock formations after losing their balance, I decided to push on. 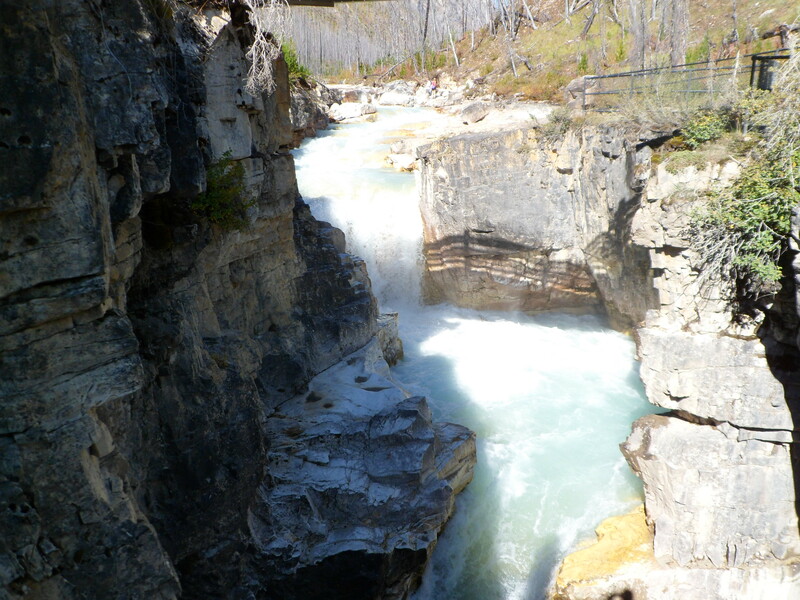 I probably would have done so even without the promise of the falls since I knew the Jarhead wouldn’t have continued up the trail without me, and I wouldn’t have wanted to deprive him of the experience of seeing the entire canyon. Nevertheless, her words were the boost I needed to get me moving again, and soon I was back on my feet, gritting my teeth, and praying I had enough cartilage to make it back down. In the end, the view was definitely worth the walk, as well as the cortisone flare I experienced a few weeks later after my first consultation with an orthopedic surgeon—but more on that later. The falls were beautiful, and thanks to the brilliant engineers who work for the Canadian park service, you can stand close enough to the water to feel its misty kisses on your face. It was truly awesome. After seeing the falls and the canyon, plus several other natural wonders in our path, we headed south toward Idaho. Then, after a brief stop at the duty-free shop (where we picked up a t-shirt and some cigars for the Princess, and a scarf and maple syrup lollipops for El Noble—I’m kidding, of course; but wouldn’t it be funny if I wasn’t?) we crossed the border at Kingsgate and officially checked the 50th state off the Jarhead’s list. That evening, we decided to make camp at Bonner’s Ferry, ID. I use the phrase “make camp” a bit loosely since we actually stayed at the Kootenai River Casino & Spa Best Western. I will remember this visit for several reasons, not the least of which was the two mile distance between our room and virtually any of the facility’s fine amenities. It bears mention here that the hallways in this section of the facility were not air conditioned. This is significant because despite the shower and the other heroic measures I took toward making myself presentable every time I left the room I couldn’t make it halfway to my destination without breaking into a sweat and leaving my fellow patrons to wonder if I had been walking in the rain or showered in my clothes. Thank goodness we were only there for a night. If we had stayed any longer, I may have been forced to wear my swimsuit to play the slots. That’s all we really saw of Idaho since after a big dinner and several drinks, we hit the casino. The jackpots eluded us, but it took me two whole hours to lose the twenty bucks I started with, and the Jarhead came out sixty bucks ahead, so we went to bed happy—and looking forward to spending Saturday in Montana.